The American Southwest is a land of extremes harshness, as well as beauty. Temperature is the most obvious extreme element — there's intense heat, especially in the lower elevations, but with cool to cold nights and winter snow at higher elevations. This is why I don’t go there in the summer unless I need monsoon photos of storm cloud and lightning. The natural landscape is stark but striking, filled with bright blue skies, brown and tan sand, and the dusty greens of the sparse foliage. 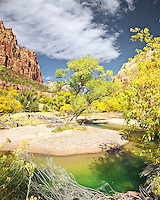 Water is scarce, but where rivers run or pools form, they provide the welcome relief of an oasis of green and the juxtapositions of the oasis is a marvel to capture. Growing up on the coast of Central California, it took me a while to appreciate the desert. Initially I viewed at as “dead country” bereft of life giving water. Later I became a photographer and learned to see photographically, this focused my silly preconceived notions. Legendary photographer Gallen Rowell wrote a revelation somewhere stating how since the desert landscape is largely bereft of forest; it reveals the shape of the land (poorly paraphrased). Of course I was drooling over the photos that accompanied the explanation. Today I find the red rocks of the desert country simply mesmerizing. The harsh light, sweeping panoramas, and sculpted pueblos of the American Southwest make it an ideal subject for photographers. An alien landscape of red canyons, silhouetted cacti, highways stretching toward distant horizons, and cowboys astride tired steeds, have been photographic subjects since pioneer photographer Timothy O'Sullivan made the first images of it in the 1860s and 70s. As a mountain lover, I especially appreciate a characteristic that our deserts share with most of the country from the Rockies west: the deserts of North America are uncommonly mountainous. The desert light is crystalline and brilliant, making deep shadows and sparkling highlights. The colors are just incredible and that is the reason I return time after time.